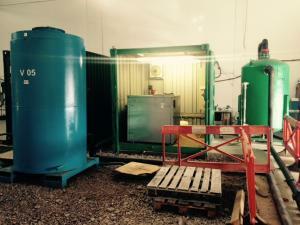 VertaseFLI undertook the remediation of chlorinated solvents at a commercial site in the South of England. We were contracted to delineate the extent of the source area and remediate by Soil Vapour Extraction. Due to the site being to the front of a commercial unit on a busy business park in an area with known services, limited site investigation data was available. Plume delineation and characterisation, gas monitoring, drilling near services, soil vapour extraction. VertaseFLI installed approximately 20 gas wells into a small area criss-crossed with a dense network of services including gas, electricity, telecoms, water and sewer. After service clearance, wells were installed using vacuum excavation techniques for trial holes before installation, with locations guided by soil sample PID readings and positive identification of service locations. Due to the sensitive nature of the site and the limited space, the well network was installed externally, but the system was installed within the commercial unit. The allowed the system secured whilst reducing the visual and aural impact of the system. Vapours were treated with activated carbon and vented externally. 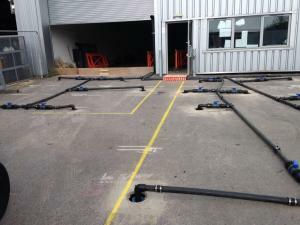 The remediation then progressed safely as planned, targeting the chlorinated solvents, including regular assurance monitoring confirming the absence of gas confirming that no gas mains were damaged during installation. The system ran successfully and was able to effectively target a previously inaccessible area of contamination, reducing concentrations within that area to under 5ppm several months after the system was shut down.